← Going on plants. More food. Yes, this is the 20th days past. It was unbelievable 1 month ago, bit now easy to write down. Since I brought back dairy in my life, all of the previous problems are gone. My personal consequence: if you do any sport, yes you truly need adequate protein intake. In my case it is around 65 g protein/day (0.8g/bodyweight kg). And to emphasize it again; this is the adequate average, what your body needs anyway to maintain itself. To build up some muscles I already need 85-90g/day at least. To reach this amount cheeses helped me. In other hand you should always be careful with too high cheese consumption, due to its high fat content (regular 30g fat (18g saturated)/100g cheese). I eat low fat products, since different nuts already contain around 50% fat and everything together would be the way too much calories/day. Currently I feel good, my performance is going well again, I am not weak and tired anymore. Furthermore it became easier and more diverse to cook complete food quickly. I found a recipe what is easy, cheap, very delicious and impossible to mess up. In one word this is a perfect vegetarian food to impress your friends. Microwaved eggplant parmesan lasagne. It worth to keep the steps, because it is ready in 30 min and I can tell you the result is fascinating. A meal again, what is perfect in this way. You will not look for meat, you don’t need it. Some personal adaptation: to save time I bought tomato pasta sauce with basil (instead of home-made Marinara) and pesto. I mixed 2 Tbsp pest with 2 Tbsp pesto and used instead of fresh basil (it was out of stock). If you are vegan, you will need to substitute mozzarella. You can use tofu, or you can also make vegan cheese out of nuts (cashew or almonds are the best). Or there is a vegan mozzarella recipe. As I wrote before; being vegan definitely forces you to get to know yourself in the kitchen! I haven’t wrote a single world about one of the best (and most obvious) vegan/vegetarian meal. Guess what! Ta-damm! Yes, it is SUSHI! I spent almost 3 weeks without meat, when it came to my mind. At the same time I was beating my head to the wall and was glad for the idea. 😀 Fortunately I have a japanese friend who was nice and helped me. Probably you think making sushi is the way too difficult and time consuming. Well, the latter can be true, so if you are in a hurry I would not recommend it. But if you have all the ingredients ready, assembling the rolls is a cake-walk. There is a step-by-step guide for beginners. Probably the most complicated part is cooking the proper sushi rice. I can tell you that saving money on sushi rice or seaweed is not worth. Just a lot of extra work and stress, what turn your sushi experience to a nightmare. We used the combination of marinated tempeh, tofu, eggs, mushrooms, carrots, cucumber, green beans, celery and dried tomatoes. The variations are endless. 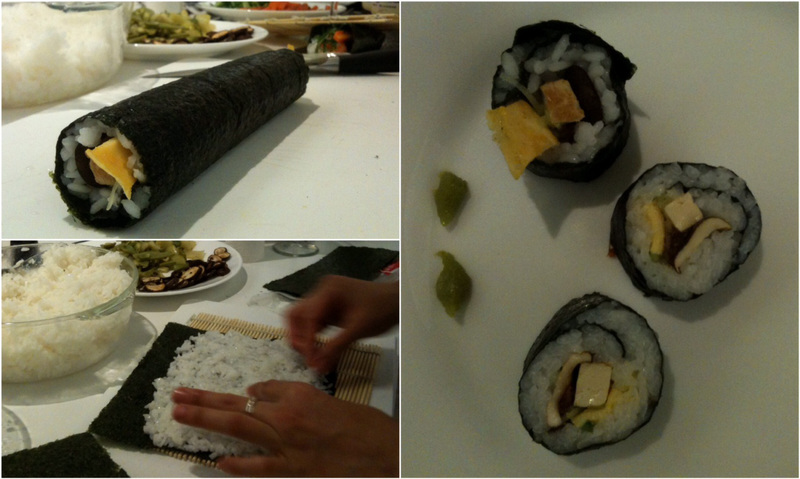 For an unusual example; we made Mediterranean sushi out of dried tomatoes, eggs, mushrooms, ruccola and feta. You can really use everything what comes to your mind. For other people there were some shrimps as well. It was a really big temptation, but I was stronger! 😉 As you can see, being VEGETARIAN is not a big sacrifice. Being VEGAN… yes it is. I didn’t/don’t miss meat, but I did miss cheese before. I don’t say I would not eat a nice cut of beef entrecote, but in general I don’t miss anything. After 20 day I can already say; in spite of every hardship in the begins, it was worth for the experience and I learned a lot. This entry was tagged diet, fitness, food, health, making sushi, sport, sushi, vegan, vegan cheese, vegan recipe, vegetarian, vegetarian recipe. Bookmark the permalink.